Uniform & narrow – a great hedge! Outstanding for its narrow habit, prolific spring-flowering, cold hardiness, and its incredible orange and red fall color! The multitude of white flowers are followed in early summer by dark berries that are a favorite of birds, and high in vitamins and antioxidants for people. Best yield of this self-pollinator is in full sun. And its columnar shape (12-15' tall but only 4-5' wide) and uniform height make it unbeatable as a narrow hedge! Thrives in most any soil that is well-drained; drought tolerant, once established. Zones 2-8. Ships in 4" pot. 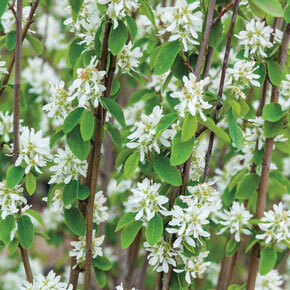 Amelanchier alnifolia 'Obelisk'. Full Sun to Partial Shade. 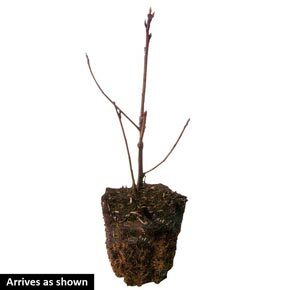 Soil Requirement: Rich, well-drained soil with plenty of organic matter.